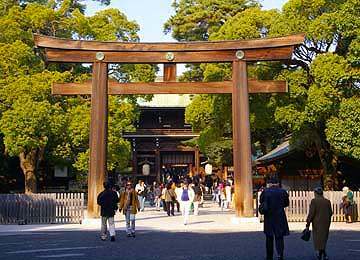 Meiji Shrine was built in 1920 to enshrine Emperor Meiji and Empress Shoken. Emperor Meiji was the first emperor of modern Japan. He took over the political power from Tokugawa Shogunate during Meiji restoration and led the country to rise up to the powerful modern state in the world. Therefore, when he died in 1912, Japanese people felt that the great age of their history had passed. 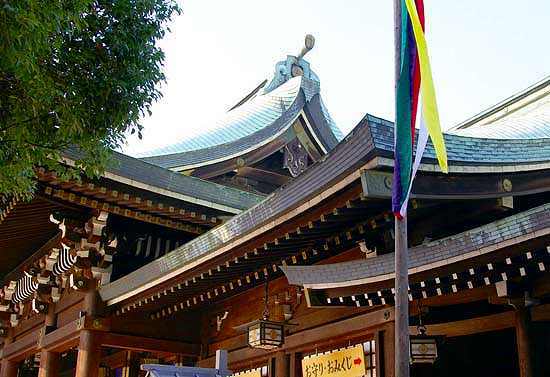 There are few examples that a big shrine has been built for a dead emperor, but Emperor Meiji was so great to Japanese people that they built a grandiose shrine to dedicate to him as a symbol of the greatness of the emperor and their ages. 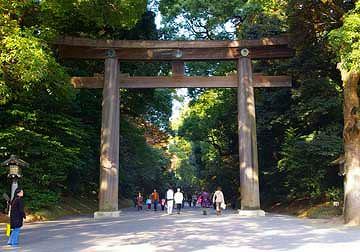 The shrine is located in the west of Tokyo near JR Harajuku station with a vast area of 72 hectares. It was destroyed by US air raid in the Pacific war and rebuilt in 1958. 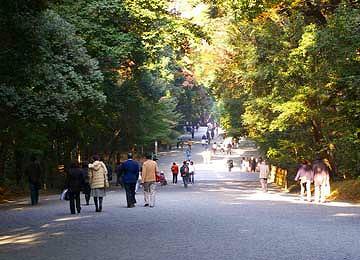 The most convenient way to get to the shrine is to walk from the JR Harajuku station. 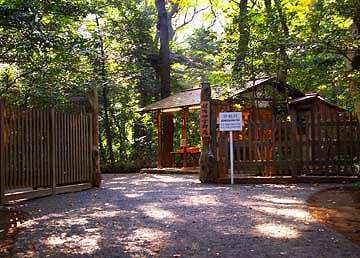 The first torii, Shinto gate, stands up at the entrance of the pathway leading to the shrine. Along the pathway various species of trees gathered from all over Japan are planted. 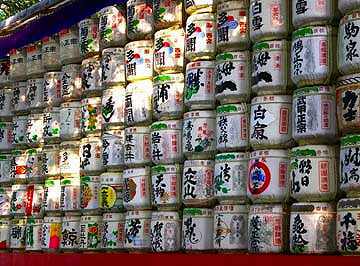 The second torii and barrels of sake dedicated to the shrine. (Left) The inner garden is famous for irises which blossom in each early summer. 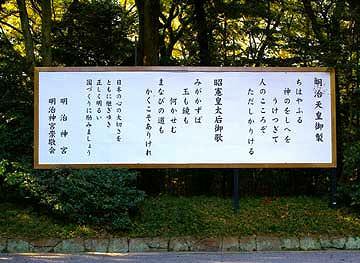 (Right) A show board on which waka, short poems, of Emperor Meiji and Empress Shoken are written. 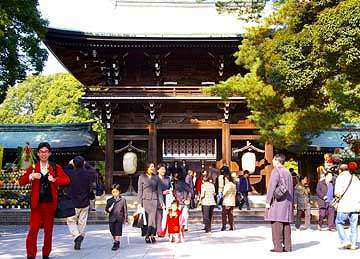 Japanese people inherit the spirit of the ancient gods. 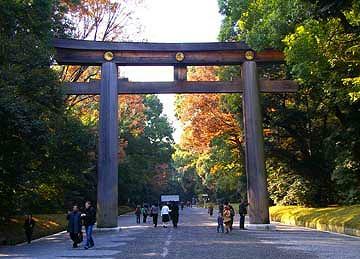 Passing through the third torii, you are in the front garden of the main shrine building. People dip up pure water from the fountain and wash their hands before worship. You bend your waist twice, clap your hands twice and again bend your waist once. 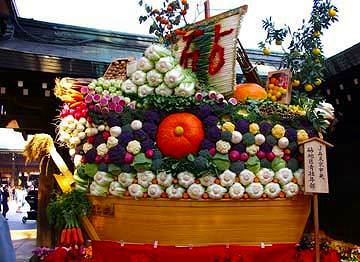 There was a decoration of takarabune, treasure ship, packed with vegetables. I saw a wedding march in front of the main building. 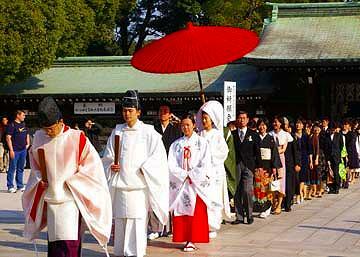 A bride and a bridegroom proceeded solemnly led by Shinto monks. 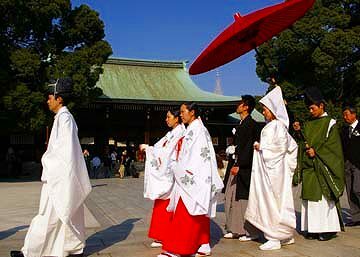 Many of Japanese couples make their wedding ceremonies in Shinto style. 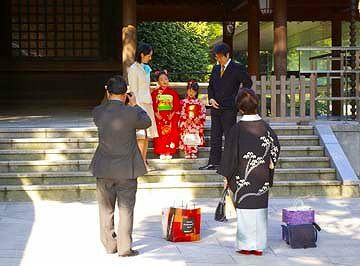 Japanese parents celebrate their children’s growth at 3, 5 and 7. The celebration is called shichi-go-san, seven, five and three. 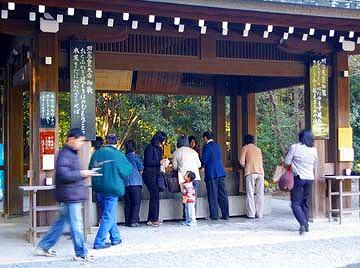 Meiji shrine is popular for the site of the celebration. 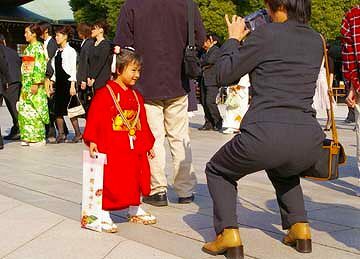 Children are dressed in beautiful clothes and taken in pictures by their families.